Ellen, Humble TX,censorship, and something even worse. Ellen is often targeted by people who are convinced her realistic portrayal of teens, their problems, and the consequences of their choices are too....realistic? Her enormous popularity among teens and Young Adult readers argues that her words ring true and resonate with them. She is not alone. Many of the authors teens love best have censorship challenges all too often. One of the most troubling things for me about this situation is that it sounds like one librarian alerted 2 or 3 parents, who then contacted the superintendent of schools. Oh, how I would like to be able to hear that first conversation. But however it went, the superintendent could have reacted by raising the question of Ellen's appearances for general discussion by all involved--including Ellen, people who have heard her speak at schools, and all the students and their parents. If he had, my guess is that the ayes would have drowned out the nays very quickly. AND...while people debated and settled on some compromise, everyone would have had a chance to think about and talk about all the issues involved. But like so many administrators before him, the superintendent ducked. So the librarian and her like-minded parents silenced an author who has--without scolding, preaching, or patronizing, helped countless kids understand that their choices are real, ongoing, and *will* shape their lives. The most concerned parents could have been given an alternative author, or could have been transported by their parents to a school with a less controversial speaker. Lessons of all kinds about free speech and democracy and personal choices would have been learned by everyone involved. I can imagine his work load, the headache he got after the phone call, the staff he doesn’t have to handle things like this. But he is in charge of a school district. This was a massive teachable moment and he opted instead to write an email un-inviting Ellen and that was supposed to be the end of it. A decision was made by a few adults that effected thousands of students and their parents without any of them even knowing it was being made. That isn’t just censorship, it is something far worse. Almost every writer I know sets Google alerts for her/his name and book titles. I do. I want to hear what people are saying about my books. Lately, the alerts have directed me to illegal download sites as well as the usual blog reviews, bookclub discussions and fan comments. As of this morning, I have seen stats claiming that my Resurrection of Magic books have been downloaded over 60,000 times. Neilhimself @kdueykduey I don't mind downloads. I figure nobody who's going to buy something won't, and it just makes readers. Your mileage may vary. Which is pretty much what I think when I can stop multiplying my royalty rate by 60,000 and let my brain kick in again. It's easier for Neil to say because of his income level, but I think he's right. I also think there is no turning back so I intend to look forward. Cory Doctorow, ((a visionary SF author, journalist, BigBrain, and very nice guy)) drove his publishers crazy putting up whole books to download on his website. But then his book sales went up. WAY up. Word of mouth matters. So here’s the deal. If you download my work for free, and you like it, do me a favor. Tell everyone you know how interesting and odd the books are. I promise to write more. 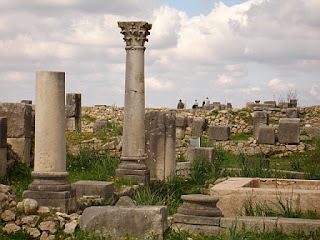 The picture is of Volubilis, the southernmost limit of ancient Roma, as far south as they ever got, in what is now Morocco. They did not have free, stolen, downloads but figured out much worse ways to screw over their artists. I have a very good excuse for not posting here lately No. Wait, I have TWO very good excuses. Second, I am traveling a lot and had to deal with a nasty flu after my last trip. I am almost completely over it YAY.